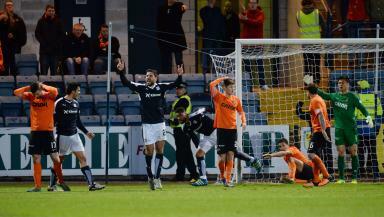 Mixu Paatelainen's men will play in the Championship next term after loss at Dens Park. Dundee United's relegation from the Scottish Premiership has been confirmed following a 2-1 defeat at the hands of city rivals Dundee. Mixu Paatelainen's side had to win at Dens Park following Kilmarnock's 4-0 victory over Hamilton Academical but they can't catch the Rugby Park men now after a goal which was claimed by both Kosta Gadzhalov and Kane Hemmings. Edward Ofere had given United the lead when he turned the ball past Scott Bain but the visitors conceded from a corner with 15 minutes to go. And United's fate was confirmed when Craig Wighton turned in a winner in stoppage time. United have endured a dire season, winning just 24 points from 35 matches and they will bow out from the top flight for the first time since 1995 after games against Inverness CT, Partick Thistle and Kilmarnock. Supporters have called for change on and off the pitch with protests against chairman Stephen Thompson while the future of head coach Paatelainen, who replaced the sacked Jackie McNamara in October, remains unclear.